Ashtanga yoga was founded by Shri K. Pattabhi Jois. Affectionately called ‘Guruji’ by his students, he was a master of yoga, Sanskrit and philosophy. He was a great man who taught the possibility of deep transformation through spiritual practice. Guruji structured the practice of Ashtanga yoga into the form we know today, based on the practices he learned from his Guru, Shri T. Krishnamacharya. Guruji taught with a never-ending faith in the practice and with love and affection for each and every one of his students. He was strong and demanding in his mission to encourage us to keep on practising no matter what. Keep practising! The practice is for the mind and the rest will come. To have been taught directly by Guruji for so many years, as well as blessed and authorised to teach directly by him, is an immense gift for me in this life. Pattabhi Jois was only twelve years old when he met his guru Krishnamacharaya, known as the father of modern Hatha yoga. Krishnamacharaya gave him the text Yoga Korunta, which described what we know as the foundation of Ashtanga yoga today. Guruji started learning yoga from Krishnamacharya at the age of twelve, and by the time he was twenty-one, he was appointed by the Maharaja of Mysore to begin the first ever Department of Yoga at the Maharaja’s Sanskrit University. It was during these years that Guruji formed and shaped formats for the practice that have influenced the way the entire world now practices and thinks about yoga. For example, the term and idea behind vinyasa, which eventually gave rise to a hybrid practice that has come to be called Vinyasa Yoga, is largely built upon his influence – though many who practice and teach it have never heard the name Pattabhi Jois. Guruji studied and taught for over thirty-five years at the Mysore Sanskrit College and has a professorship in Advaita Vedanta, a philosophical view. In 1948 he established the Ashtanga Yoga Research Institute (AYRI) in Mysore. In 1964 the first western student arrived and since then the Ashtanga yoga community has been steadily growing. Guruji went to teach in the USA in the 70s and travelled all over the world to teach what he loved and lived. He fell in love with and married Savitramma (known as Amma), who came from a long line of Sanskrit scholars. They had three children: Manju, Ramesh, and Saraswathi. Saraswathi is the mother of Sharath who now teaches at the main shala in Mysore. 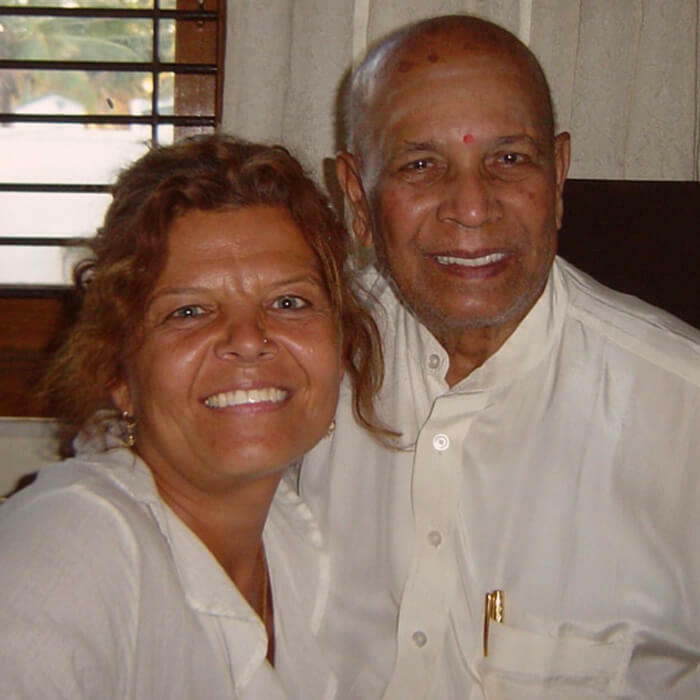 Guruji’s eldest son, Manju Jois, decided to remain in America after travelling there with Guruji in 1975. He runs a yoga shala in Carlsbad, California and travels extensively, teaching international workshops. Saraswati teaches in Mysore and all over the world. Guruji loved his students and he loved to teach. After his wife Amma’s death in 1998 he lived for his teaching and his students. He continued to teach and travel right up to his final days. Guruji left his body at home in Mysore on May 18th 2009 at the age of almost 94. He left us all with a huge emptiness and is missed beyond words.